Third: I dislike the mix of concerns of the app launcher (as it is now). On the one hand it provides short cuts for favorite apps and on the other side its displaying opened apps. Also it does not scale good enough for the latter and doesn't look and feel nice when the icons to be displayed exceeds the height of the launcher. I too use the app overview and switching all the time. Not clearly noticed before, but switching apps really seems not as straight forward and quick as it could be. The long-swipe + overview selection operation is getting longish for quickly changing to another app, compared to the quick flip (currently available only to get to the last app). Nevertheless, the app overview is important and could be a nice place to allow reordering apps by dragging, but thats not possible now. Instead I find it each time showing the apps in a different order (last used put to the back (left) and the home scope always insterted as second). It might be easier and quicker to navigate if the sorting order would be kept, if not rearranged by dragging in the app overview, or no other sorting order was selected. Thinking about the app launcher access overloading the interface and maybe it not fitting in too well with small form factors, maybe some way could be found to merge the useful parts of it into the "home" function on smaller devices. 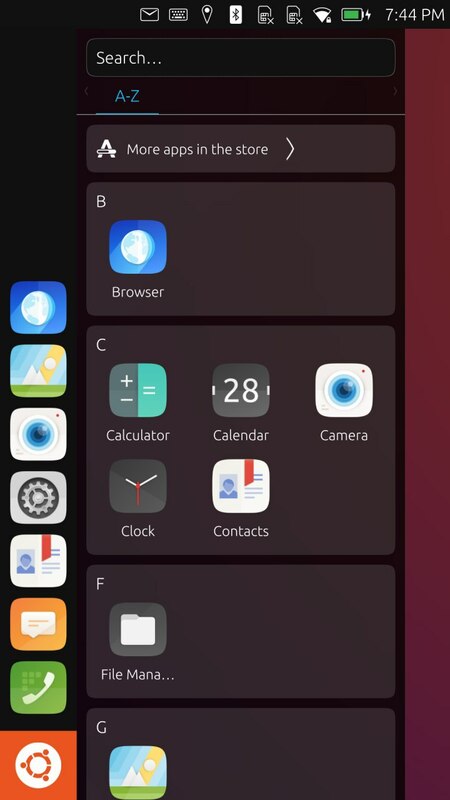 by touching the blurred "home" background when in the app switcher.